Hotel Offers in Los Llanos de Aridane. Make your apartment or hotel reservation in Los Llanos de Aridane for your holidays or business trips at the best price due to this fantastic offers. From here you might see the best hotels in Los Llanos de Aridane, on the Western region of La Palma in the Canary Islands. If you wish to try availabilities and prices of hotels it’s necessary to select your arrival and departure dates. To do so, click on the calendars below and then press Search. For more information on each room or hotel click on top of it. Offering free WiFi and sea views, White Heaven is an accommodation situated in Los Llanos de Aridane. With pool views, this accommodation offers a swimming pool. Located in Los Llanos de Aridane in the La Palma Island region, Casa Pastelero has a garden. 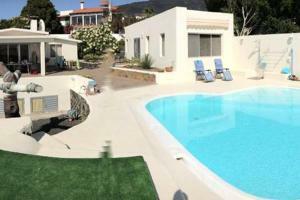 The accommodation is 30 km from Santa Cruz de la Palma. Puerto Naos is 6 km from the country house.